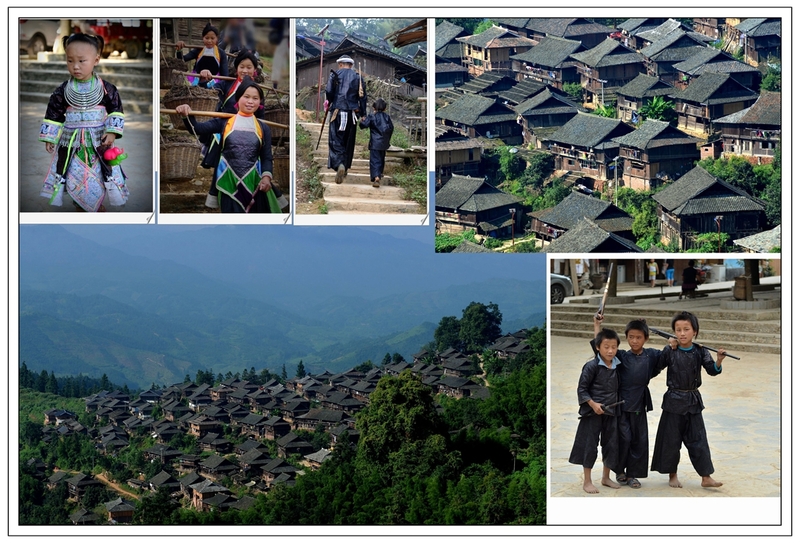 12 Day Tour of Minority Culture in Guizhou province – Guizhou C.I.T.S. from Miao, Gejia and Dong people. You will see the 100-bird embroidery, silk-felt embroidery, break-thread embroidery, folded-silk clothes embroidery, flat-thread embroidery, Chinese-knot embroidery, braid embroidery, many kinds of cross stitches and so on. You can also meet the minority women spinning, weaving and even doing some dyeing process. During the festivals, Gejia and Miao people can be seen, wearing their most beautiful costumes and silver in different types, each of which shows different among the ages, so they have costumes for the Children, the youth and the elderly. Besides these colorful-dressed people, you can also see their dancing, singing, playing Lushengs (music instruments), and buffaloes fighting, horses racing and all other kinds of activities! There grows many trees in Southeastern Guizhou, and so most of the traditional houses are made of wood. 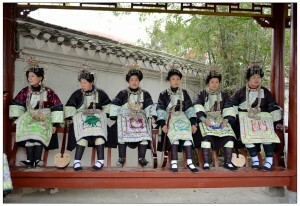 The structure and character of the wooden architectures among Miao, Dong and other ethnic groups are general different. But those who are living closely, no matter what nations, usually imitate the building style to each other. The minority villages are located by the hillsides, riverbank and even on the top of the mountains. This Karst landform area, the stone hills in different shapes, the caves, terrace paddies, wood and bamboo are greeting you here and there. Rural markets are usually regarded as the best and important places for the local people to do some business and meet, and also the good opportunities for the young people to show off and find their lovers, so on that day they often come with clean and traditional dress. For the visitors, it is the opportunity to enjoy the local traditional culture and people. Daily life is also interesting, while walking around, you will see: the children walking to schools, farmers are carrying grass or wood walking behind the cattle, sometimes when you are lucky, you may meet the wedding, celebrating new house, new born baby or funeral and sometimes you even get a cup of rice wine from a woman with singing drinking song. Everything seems not the same as you ever experienced. You can even step into their house to see how the local people doing house work and their family life. Arrive in Guiyang airport (You will be picked up in the airport and transfer to the destination, 2 and half hours’ driving.). Stay overnight there. 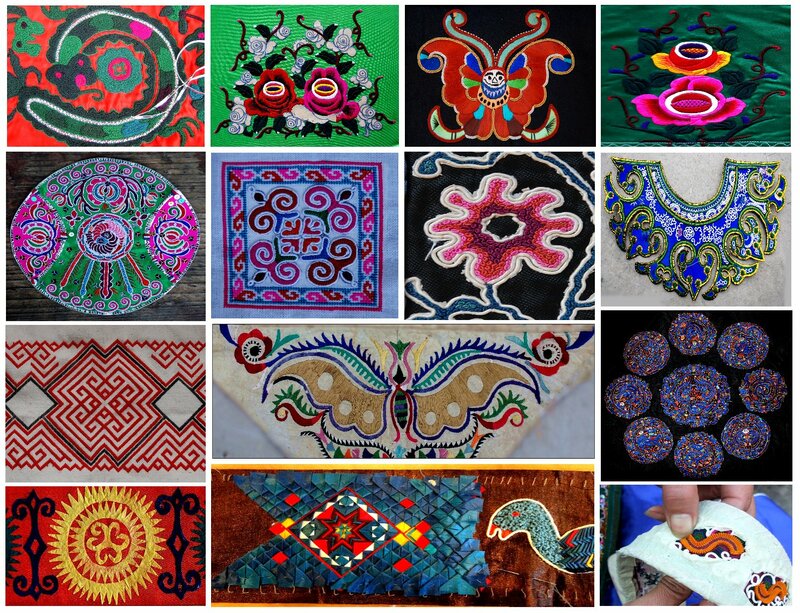 Visit the 100-bird Miao village and see their special embroidery on the silk-felt clothes. Visit the rural market and you will see plenty of the textile stuff, and then visit the village with the papermaking by hand and the village with silk-felt and flat embroidery. Visit the Miao village of the folded embroidery, the short-skirt and the long-skirt Miao villages with braid embroidery and cross stitches. 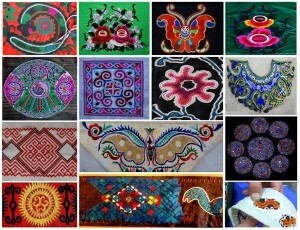 Visit the Gejia village and their special turn-over embroidery and batik technique, then drive to the Lusheng Festival. Drive visit the rural market and also the break-thread embroidery and silversmith village. Many primitive Miao villages and their beautiful terrace and natural scenery stand along the way. 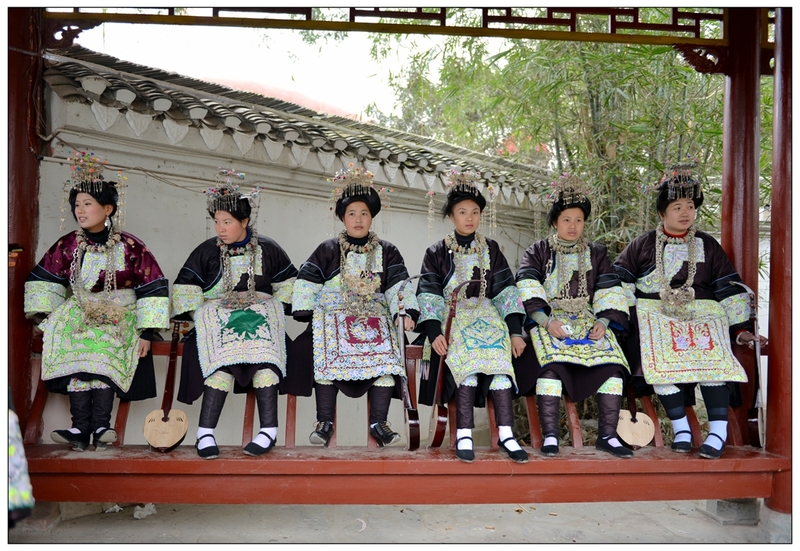 Then visit the special mini-skirt Miao village and their cross stitch. Visit the orange-embroidery Miao village and multi-embroidery Dong villages. Visit the rural market at the Dong village and also their special wood architectures and textile (spinning, weaving and dyeing cloth by the Dong people). It is the biggest Dong village in the world, here you can see some textile process, such as weaving, dyeing, beating and even pleating cloth for making skirt, and of course embroidery of Dong style. It is also one of the Dong villages with the concentration of Dong’s architectures, for example the drum towers, roofed bridges, village gates and opera stages. From here can have two options to leave Guizhou. 1). Driving 1 hour to Liping airport (now there are only 3 flights) to fly to Guiyang, Guangzhou and Shanghai. 2) Driving 4 hours to Guiyang airport to fly to any city inside China. Accommodation: (11 nights in the standard hotels). Food. All the meals (Breakfasts, Lunches and Dinners) are included.